Beginning May 5, 1840s will be giving tours of the Carroll Mansion and Phoenix Shot Tower for free, to our guests. Tours are from 11:00am-12:00pm and start in the upper Courtyard of the 1840s Carrollton Inn. The Carroll Mansion was home to the longest living signer of the Declaration of Independence. The house was originally constructed between 1804-1808. 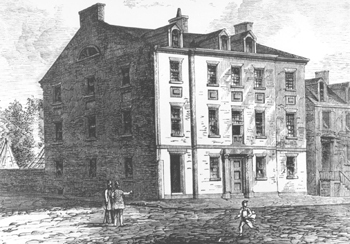 Richard Canton bought the house in 1820 and Charles Carroll, Canton’s father-in-law, stayed there. He died on November 14th, 1832, at age 95 in the mansion. His death became recognized as a local and national event because of his importance in the community. After the death of the owners, the property changed hands several times, being used for a brewery, a saloon, a restaurant, apartments, tailoring firms, and even a school.In 1967 the mansion was renovated and open to the public as a historic house museum until 1997. 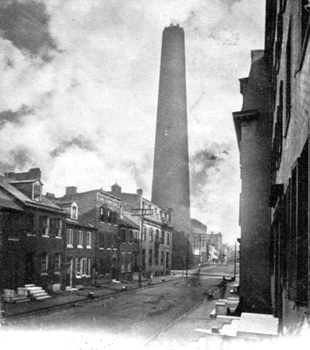 The Phoenix Shot Tower was the tallest building in the United States when it was built in 1828, and remained that way until 1846. The building, which is 215 feet tall, was built this way because of the method used to make bullets. Molten was poured down a cylinder at the top of the tower, and by the time it reached the bottom it was cooled and perfectly shaped as a bullet. In 1892, a new way of making bullets made this building obsolete so it was shut down and eventually became a historic landmark. Don’t miss this great opportunity to see and learn about great Baltimore history. Coffee will be served and if you have luggage we would be more than happy to store it.